Last week I went to see Your Name, an animated film by the Japanese director Makoto Shinkai, in the cinemas. 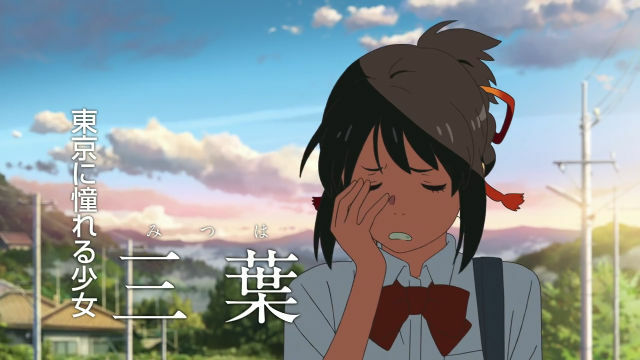 If you haven’t heard about Your Name, I suggest you take a look at the trailer below. Your Name (Kimi no Na wa. in Japanese) opened this year in August in Japan. Since then, however, it has also opened in several other countries and here in Australia, it opened for a limited run on November 24. I myself only found out it was being shown here when I was searching for Rogue One: A Star Wars Story tickets on the Hoyts Cinemas’ website. Anyway, I’m really glad that I went to see it. It’s a gorgeous-looking film, with a simple but captivating story and one that really makes you feel for the characters, which I believe is a trait of Makoto Shinkai’s stories and something that greatly appeals to me. 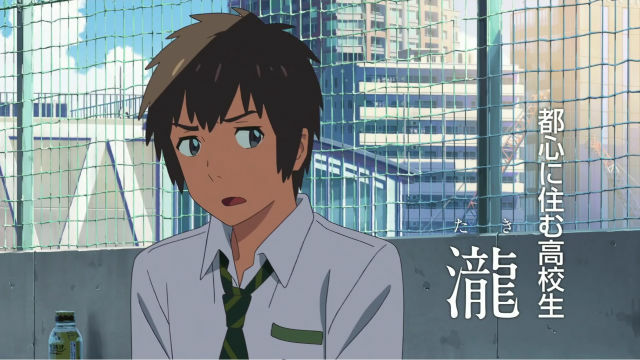 The basic premise of the film is that a Mitsuha (a teenage girl from the country), and Taki (a teenage boy from Tokyo), who do not know each other, mysteriously start body-swapping one day. As you might expect, this bizarre situation initially lends itself to a series of humorous incidents. But the tone of the film dramatically changes when the body-swapping abruptly ends. Taki then feels compelled to try and find Mitsuha. But will his search end happily? I’ve been interested in Makoto Shinkai ever since I read about him in a Japanese magazine and learned that he first started making animation by himself on his home computer. He has made six films, of varying length, but Your Name is by far his most successful: it is getting a lot of attention worldwide and in Japan, it is now the second highest-grossing domestic film behind Spirited Away, by the well-known Hayao Miyazaki and Studio Ghibli. Until I saw Your Name, I myself had only ever seen his first film, Voices of a Distant Star, but now I definitely want to see his other works. And when Your Name is eventually released on DVD and Blu-ray, I’ll definitely be getting a copy. It really is a fantastic film. This entry was posted in Anime, Impressions, Japanese Films, Trailers and tagged Makoto Shinkai, Your Name by maruserino. Bookmark the permalink.